The appointed incumbent in District 2, Catherine Stefani, did not seek our endorsement. Her main challenger, Nick Josefowitz, currently serves on the BART board. He's good on a few transportation issues (e.g., he supports making Muni free to riders), but even in this area, we have major concerns about Josefowitz's positions. For example, he appears to be OK with the status quo of Uber and Lyft flooding our streets with cars and driving down Muni ridership, and as a BART board member, he supported dragnet surveillance of BART riders. On many issues, we find Josefowitz in opposition to Green Party values. He's strongly in favor of developing more market rate housing...presumably in areas of the City that won't block his wealthy constituents' views. He failed to take a position on some controversial issues, such as public power, Care not Cash, and development of radioactive land in the Bayview. He also supports anti-environmental practices such as paving over our parks with artificial turf, and the addition of toxic groundwater to SF's water supply. We therefore did not make any endorsement in District 2. District 4 has several great grassroots candidates running, including Green Party County Council member Mike Murphy. We are excited to endorse him, as well as SF Berniecrat activist Adam Kim for the #2 position. Mike Murphy is a long-time activist who has been a key part of many campaigns to take back SF from the political machine that has ruled City Hall for decades. He and other Sunset residents have fought to keep natural grass in Golden Gate Park, and to prevent a wall of luxury condos from being built next to Ocean Beach. He also helped lead the "Recall Ed Lee" campaign in 2016, which was blocked by the Department of Elections. Murphy has been a resident of the Outer Sunset since 1996, and has a child in the public school system. He has been registered Green since he arrived in the City. His election will be a welcome change from the string of appointed Supervisors in D4 who have served as a rubber stamp for the Willie Brown machine for years. Adam Kim is an activist with the SF Berniecrats. He is not registered with any political party, but his values are consistent with Greens. Like Murphy, Kim supports instant runoff voting, public power, and police accountability. Both Kim and Murphy were strong supporters of the Community Housing Act (https://www.sfcommunityhousingact.com/), which Greens hope to help bring back to the ballot in a future election. Kim also supports strong regulations on Airbnb, Uber, and other "gig economy" businesses. We are disappointed that neither of the two more mainstream candidates, Jessica Ho and Gordon Mar, filled out our endorsement questionnaire or sought our endorsement. Another D4 candidate, Trevor McNeil, did seek our endorsement, but we found his views to be too close to those of Katy Tang, the current incumbent. We strongly encourage a #1 vote for Mike Murphy and a #2 vote for Adam Kim. Matt Haney currently serves on the SF School Board. He generally agrees with the "progressive" wing of the Board of Supervisors, all of whom have endorsed him for election. He agrees with Greens on many issues, including public power, SFPD reform, expanded voting rights, and making Muni free to riders. Haney's more conservative than we are on housing issues: e.g., he mistakenly believes that Katy Tang's "density bonus program" will lead to more affordable housing, and he doesn't support a ban on Airbnb. Former Planning Commissioner Christine Johnson also sought the Green Party's endorsement. Johnson embodies the current culture of "pay to play" at City Hall: she served simultaneously on the Planning Commission and as the director of SPUR, a pro-developer think tank. In these roles, she solicited donations from luxury housing developers with one hand, while rubber-stamping their proposed projects with the other. Johnson is also remembered for switching a key swing vote at the Planning Commission in response to a text message from Mayor Ed Lee. As a result of her vote, Airbnb was allowed to profit from vast numbers of illegal rentals for years without any City oversight. Even though we expect Matt Haney would be far less progressive than his predecessors on the Board, we endorse him as the best choice for D6 in this election. No candidate for D8 Supervisor sought our endorsement this time, although we just endorsed Rafael Mandelman in June. Mandelman has no serious competition for re-election. Kelly is especially strong on both public safety and development issues. He supports expanded foot patrols and other police reforms, and has a credible plan to reduce violent crime in his District. Kelly also fought hard against the Lennar corporation's development project and other corporate polluters in the Bayview who have cut years off the average District 10 resident's life. Kelly agrees with the Green Party on many other issues, from public power and CleanPowerSF, to the need to end corruption in City Hall. Although Kelly still serves as President of the Potrero Hill Democratic Club, he has recently re-branded himself as a socialist, and his campaign is strongly supported by the local Democratic Socialists of America (DSA) chapter. We hope that this additional force of volunteers, and the public attention that is finally being paid to Lennar's development of housing on radioactive land in the Bayview, will make the third time the charm for Kelly's campaign. Several other candidates from D10 sought our endorsement, but Kelly is the only one who convinced us that he can end the string of pro-Lennar D10 representatives and strongly advocate for environmental justice in City Hall. Representing San Francisco on the BART Board is a tough job, as the incumbent will often be outvoted by their suburban counterparts. Collectively, the BART board has made some incredibly stupid decisions in recent years, from the Oakland Airport Connector boondoggle to hiring expensive Muni-style "fare enforcement teams" to harass their riders. During the last round of labor negotiations, they wasted money on hiring an expensive union-busting consultant, resulting in an expensive strike and several deaths. In the last year, BART has focused on building higher fences and new facades for their stations while neglecting maintenance of their trains to the point where even a light rain routinely causes half-hour delays. Janice Li is a strong supporter of Muni and bikes, and otherwise generally agrees with the Green Party on transit policies. She's pro-union, and has stood in opposition to the long list of bad decisions above. She would be a welcome addition to the BART Board. Brigitte Davila & John Rizzo are current members of the College Board. With three seats up for election, we are pleased to endorse both of them for another term. A major issue in this election is the long-term prospect for the Free City College program. Voters passed Prop W (which we strongly supported) in 2016 to fund the program. However, Mayor Lee imposed a spending cap of around $6 million on the free tuition program. This has resulted in the program running a deficit, even though Prop W brings in nearly $50 million each year! We expect Mayor Breed to follow the voters' mandate and extend the program, and expand it to include additional benefits such as free textbooks. We also want to see the Free City College program extended indefinitely beyond its initial 2-year period. We enthusiastically endorsed Davila last time, as most of her positions are in line with Green values, including support for free education, rights for undocumented immigrants, and opposition to military recruitment on campus. Although we did not endorse Rizzo last time, both he and Davila did a great job of stepping up to finally solve the accreditation crisis. We also appreciate their support for public housing on the Balboa Reservoir site adjacent to City College (although they were not joined by their colleagues). Thea Selby is another incumbent Board member who sought our endorsement. However, as was the case 4 years ago, we are not endorsing her out of concern for her support of military recruiting on campus, and her opposition to non-citizen voting. We strongly endorse both Brigitte Davila & John Rizzo for another term. A number of candidates are running for three open seats on the school board. 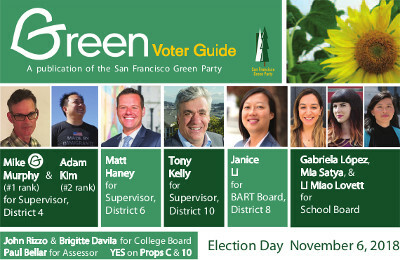 The Green Party picked the best among them: Gabriela López, Mia Satya, & Li Miao Lovett. We think the school assignments should be made using multiple criteria, with the goal of balancing neighborhood schools with maximal racial and economic diversity. Because our neighborhoods are segregated, we do not support a simple approach in which proximity to a school trumps other criteria. We recognize that JROTC is a military recruiting program, and we support replacing it with alternative programs that teach leadership skills, such as one based on Neighborhood Emergency Response Team (NERT) training. Given our military's role in the world, we see support for JROTC as incompatible with progressive values. We think that using 7 weeks of class time each year on preparing for and taking standardized tests is a waste of valuable instruction time. The reading assessments (Fountas and Pinnell) that teachers give students throughout the year are useful in assigning them challenging reading material, but the Smarter Balanced (SBAC) tests are a waste of time. We want board members to push back hard on state testing requirements, and to actively support parents' right to opt out. Gabriela López is currently an elementary school teacher. She understands these issues well and agrees with us on all of them. Mia Satya is not a teacher, but she is great on these issues, and also has expertise in bullying prevention. Li Miao Lovett is a Westside parent, who also agrees with us on these key issues. We strongly support all three. The Assessor's job is to keep track of the value of each property in SF so that it can be taxed at an appropriate level. For years, corrupt politicians from the Willie Brown machine (like the incumbent) have occupied the office. They often let politically-connected large businesses pay as little tax as they want. Paul Bellar is a professional real estate appraiser, and he'd bring both competence and honesty to an office that has long been lacking both. We strongly support his candidacy! Jeff Adachi is running unopposed for another term as Public Defender. Although we were disappointed by his attempts at pension reform in 2010, his work in the past several years has been stellar, and we're happy to endorse him for another term. In particular, we were very impressed with Adachi's handling of the Steinle murder trial, in the face of nation-wide right-wing attacks. San Francisco is one of the only places in the US where a destitute defendant can receive top-notch representation from lawyers like Matt Gonzalez. We also appreciate Adachi's work on reforming the cash bail system, which keeps people in jail while they await trial just for the "crime" of being poor. Adachi has also been appropriately skeptical of bail reform efforts that have given judges more power to imprison defendants before their trial. Prop A is a $425 million bond to rebuild the seawall along the Embarcadero. The wall stretches from Fisherman's Wharf to the ballpark, and provides some protection for downtown in major storms. The wall is 100 years old and may fail in a major earthquake (although it luckily survived in 1989). The Green Party opposes Prop A for several reasons. First, Prop A is just a down payment on a multi-billion dollar project. Seawall proponents are unable to project how much the project will eventually cost, but based on other major projects like the Central Subway, the Transbay Terminal, Van Ness bus lanes, and the Bay Bridge, it will certainly provide politically-connected construction companies with as much money as they can shovel in to their bank accounts for years to come. The new seawall will mainly serve protect a small area of Downtown and South of Market that is built on landfill and is rich with multi-billion dollar corporations and luxury condos. Since these wealthy folks will receive almost all of the benefits from the new seawall, they should have been asked to pay the bulk of the costs. Seawall proponents promise to ask residents and businesses in the area to pay only if SF voters reject Prop A. We think that a tax on on landfill-based properties might be a good alternative to Prop A. Another huge problem is that the seawall proponents haven't considered the impact of sea level rise over the coming decades. It is likely that the new seawall will be underwater by the time it's finished. Greens have accepted the reality that the only solution to global warming-induced sea level rise is a managed retreat from our shorelines to higher ground. Rather than spending billions in a futile attempt to bail out corporations that have unwisely built on landfill, let's instead invest money to move critical public infrastructure away from the flood zone. The SF Green Party is generally opposed to bond funding unless there is a compelling public benefit (see our Statement on Bond Funding below). We are not convinced that a replacement seawall qualifies. Prop B is a scam that pretends to protect San Franciscans from internet companies that sell private details of our lives to advertisers. Instead, it was written to protect our corrupt politicians from journalists who let the public know what happens in the proverbial "smoke-filled rooms" at City Hall. SF has some of the strongest Sunshine laws in the country, and they can't be weakened without voter approval. Prop B is a Trojan Horse, asking voters to give up our right to approve any future changes to the City's Sunshine laws, in exchange for privacy protections. If the Board of Supervisors really wanted to protect San Franciscans from internet spying, they could easily pass regulations without going to the ballot. If Prop B passes, journalists will no longer be able to find out who politicians meet with. The "privacy rights" of lobbyists will trump the public's right to know what our elected officials are up to. Corruption is bad enough in City Hall already: the Mayor's office allows huge cost overruns on every major public works project. The corporations awarded City contracts by the Mayor do substandard work, pocket the profits, then return a small percentage of their stolen money as campaign donations and PAC spending. Even "progressives" get in on the action, steering City money into politically connected nonprofits that divert taxpayer money from public services into supporting their preferred candidates. SF's Sunshine laws are one of the few ways voters can keep our corrupt "City Family" in check. Let's protect these laws by rejecting Prop B. Prop C is a tax on large companies (those with $50 million or more in gross receipts), which will raise $300 million per year to help homeless people in San Francisco. Greens strongly support Prop C, because $300 million each year will be enough money to make a major investment in improved services and low-income housing, while the costs will all fall on major corporations that just received a huge tax cut from the federal government. A maximum of 3% of the revenue will be used for administration, and an oversight committee will be created that will report to both the Board of Supervisors and the Mayor. Unfortunately, the beneficial effects of Prop C may not be realized for some time, due to our current leadership. San Francisco has now been run by the Willie Brown machine and his hand-picked mayoral successors for 23 consecutive years. This regime has shown no interest in helping homeless people--on the contrary, it has cynically used them as a tool to win elections. Police push homeless encampments away from the Mayor's wealthy supporters, and into communities that support progressive leadership. Mayoral policies create unsafe conditions on our streets, which voters often blame on their district Supervisor (e.g., Jane Kim when she challenged London Breed in June). Because San Francisco's budget is nearly 100% under the control of the Mayor, we expect little of the Prop C funds will be used to actually help homeless people until we have a change in leadership. Prop C was put on the ballot by many of the same non-profits that hope to receive City funding from the measure. We expect that the Mayor will use Prop C funding to keep these non-profit leaders on a very tight leash. That being said, it's very important to pass Prop C now, without waiting another 9 years for our next chance at an open Mayoral election when we stand a chance of evicting Willie Brown's cronies from City Hall. By voting YES on C, voters will make a strong statement in favor of housing homeless people, and more importantly, establish a long-term funding stream to do so. This is an important first step, and with our Key Value of Future Focus in mind, we enthusiastically support Prop C! Prop D is a 1% to 5% tax increase on cannabis businesses that earn over $500,000 per year in gross receipts (higher income businesses will pay more). If Prop D passes, the tax rates and thresholds can be adjusted the Supervisors, with a simple majority needed to lower taxes (down to 0%) and a 2/3 supermajority needed to raise them (up to 7%). The Prop D tax will not apply to sales of medical cannabis. Greens support Prop D, as it is a progressive tax that will fall mainly on large corporate cannabis businesses that are forcing small "mom & pop" businesses out of the market. We don't want to see legalized cannabis dominated by "Big Weed" in the same way that "Big Tobacco" has taken over that market. Prop D tax revenues will go into SF's General Fund, and will therefore benefit San Franciscans even if they are not cannabis users. Prop E is a re-run of 2016's Prop S, which we also opposed. It was re-written to only require 50% to pass. (correction, Nov 5: Prop E also requires a 2/3 supermajority to pass.) Like Prop S, Prop E would take control of hotel tax revenue away from the Board of Supervisors, and put it into a fund that must be spent on specific priorities favored by the proposition's authors. While well-meaning, the intended results of Prop S could (and should) be prioritized at City Hall by legislators who care to listen to their constituents in their communities, instead of being Prop-ed up on the ballot as set-asides. Many who contributed to getting Prop S on the ballot and beyond truly do care about the cultural heart of the City and the welfare of all who call SF home. Others invested out of self-interest and, likely, to promote their own questionable standards of taste. A real work of art would be a functional Board of Supervisors. A real feat would be a concerted effort to change a dysfunctional economic system that leaves families without homes. We therefore encourage a NO vote on Prop E.
While we strongly support our veterans, and would support giving veterans a higher priority in getting into publicly financed housing, we don't think that such a large sum of public money should be issued exclusively on private housing for veterans, while ignoring other people in more desperate need for housing. When bonds are used, they should be used only for urgent investment in the public sector. Public bond money should not be used for private cars or private housing. The same arguments still apply, so we urge a NO vote on Prop 1. Also, please refer to our Statement on Bond Funding, below. Prop 2 is a modification to 2004's Prop 63, which we also supported. Prop 63 enacted a "Millionaire's Tax" (on annual personal incomes over $1 million) that currently brings in around $2 billion each year to fund mental health services in CA. Prop 2 would allow CA to use some of that money to issue $2 billion in revenue bonds, which would be used to build permanent supportive housing for homeless people. We see Prop 2 as being consistent with the intended use of Prop 63 funds, as homelessness can be a significant cause of mental illness. Prop 2 would build around 20,000 units of permanent supportive housing, and it's therefore a good investment to help reduce mental illness. Greens note that bond-funded housing should be publicly owned, which Prop 2 does not guarantee. And we note that Prop 63 is only needed because we still do not have universal health care, which should include mental health services. But while we continue to fight for those priorities, we see Prop 2 as worthy of our support. There are a lot of good projects in there, including water recycling and cleanup of contaminated groundwater... However, the main purpose of Prop 1 is to build additional dams. Dams are terrible for the environment, since they generally increase the salinity in downstream areas and kill fish and other wildlife. Dams will also do nothing to help the current drought crisis, since they simply store water that comes from mountain snowmelt. Bond funding also ensures that CA taxpayers will pay for the project twice: once for the project itself and once to borrow money from Wall Street (see our Statement on Bond Funding). We therefore strongly oppose Prop 3, for the same reasons. Prop 4 is a re-run of 2008's Prop 3, which we also opposed. Both are billion-dollar bonds to give money to children's hospitals. As in 2008, we are concerned that this bond money is not being spent in the public interest. Much of the money will go to private hospitals, including "non-profits" that pay their CEOs exorbitant salaries. As we wrote in 2008, if taxpayers are going to fund the expansion of privately owned hospitals, the taxpayers should get a share of the ownership. A universal health care system would be a much better use of our scarce tax dollars than issuing more bonds. Prop 4 perpetuates our unfair, privately dominated medical system, and we therefore oppose it. Prop 13 has been amended several times to allow older homeowners to move to other properties without their taxes increasing. However, this can currently be done only if the move is within the same county or to other counties that allow it (currently about half the state). Prop 5 would allow homeowners from counties like SF and LA with high home prices to move anywhere in the state, transferring their tax savings with them. This would be great for Realtors who profit from the sales of expensive homes. But it would be devastating for the local governments of inland counties, which would see their tax revenues disappear if people from wealthy coastal areas moved in. Prop 5 is a capitalist band-aid on the real problems of older homeowners who want to move to smaller homes without facing huge tax increases. Greens support programs like social housing, which would create affordable housing for people of all income levels. A statewide social housing program would allow older homeowners to sell their buildings to the government to use for affordable rentals, and move closer to their families without any increase to their housing costs. Prop 6 repeals the vehicle and fuel taxes and fees that were enacted by the CA legislature last year (12 cents per gallon on regular unleaded gas), and it would also require voter approval for all future increases in state gas taxes and vehicle fees. Gas taxes fund road repairs as well as public transit and bike infrastructure. If we're going to take climate change seriously, private automobile use should be even more expensive, while public transit should be free. If Prop 6 passes, our infrastructure will continue to crumble just to save Hummer drivers a few bucks. Vote NO! Prop 7 would allow the legislature to keep CA on the same time year round, instead of switching our clocks an hour forward or backwards twice each year when we go on or off Daylight Saving Time (DST). Such a legislative act would require a 2/3 vote, as well as federal approval. Research has shown that the sudden 1-hour time change twice a year is hazardous to our health. Every time, the disruption in sleep patterns leads to a increase in heart attacks, strokes, and traffic accidents. Proponents of keeping DST say they are worried about children having to go to school in the dark. However, this problem could easily be solved, if necessary, by starting school an hour later in the winter. Prop 7 moves CA closer to the rest of the world, where 68% of countries do not change their clocks. Vote YES on 7. Prop 8 would limit profits and otherwise regulate companies that provide dialysis, thus lowering the costs of health care. It was put on the ballot by SEIU-UHW (Service Employees International Union-United Healthcare Workers West), as part of a campaign against several large, rabidly anti-union, medical corporations. We'll continue to fight for universal health care for all. In the meantime, we're happy to stand in solidarity with SEIU-UHW in supporting Prop 8. Prop 10 would repeal the Costa-Hawkins law enacted by the state legislature and signed by Republican Governor Pete Wilson in 1995. Costa-Hawkins prohibits certain types of rent control. Therefore, Prop 10 would give cities like San Francisco more freedom to adjust our rent control laws to benefit tenants. Prop 10 would allow cities to enact rent control on newer buildings (built after 1995) as well as on condominiums and townhouses. Currently, we have a limited supply of rent-controlled housing, which can only shrink as older apartments are replaced or converted to condos. Prop 10 would give tenants a much better selection of places to live. Even more importantly, Prop 10 would allow cities to vote to enact "vacancy control" to limit the amount by which rents can increase on new tenants. The lack of vacancy control currently gives landlords huge incentives to evict long-term tenants, leading to many illegal evictions. Prop 10 would restore an essential right to local governments, and would be especially welcome here in SF! Prop 11 would require ambulance employees to stay on call during their breaks. The proposition is funded by the country's largest private ambulance corporation, and is an attack on the rights of their workers. If Prop 11 fails, private ambulance corporations will have to hire approximately 25% more drivers, or negotiate with their employees to provide other benefits in exchange for fewer breaks. We agree with Prop 11 proponents that ambulance costs are too high. We need to lower costs, but not at the expense of eliminating worker rights. Instead, we must make ambulances a public service that are free to patients. CA has more than enough money to provide public ambulance service with drivers as public employees, rather than contracting essential services out to shady corporations. Prop 12 is an amendment to 2008's Prop 2, which we also supported. Prop 2 was a ballot initiative that required farm animals to be raised in less cruel conditions. Opponents sued to prevent implementation of the law, claiming it was too vague. Prop 12 amends Prop 2 to set lower limits on the amount of space that each animal can be confined to. It also allows these regulations to be enforced by the state of CA, rather than by local police (who are often sympathetic to the large agricultural corporations). As we said in 2008, Prop 12 does not go far enough in requiring animals to be raised in a "free-range" environment. However, we support Prop 12 because it will help reduce some of the most cruel practices of modern factory farms. The SF Green Party has often been hesitant to embrace bond financing. In addition to being environmentally and socially responsible, we are also fiscally responsible. Bond funding requires payments totaling about twice the actual cost of whatever improvements are made, and passes costs on to future generations. Because people who buy bonds are almost exclusively the wealthy, as investors are paid back over the 20-30 year life of the bond, wealth is transferred from middle and low income taxpayers to rich bondholders. Bond funding also helps rich people avoid paying their fair share of taxes, since interest on municipal bonds is exempt from both state and federal tax. As noted in the California Voter Guide in 1992, over 35,000 U.S. millionaires supplemented their income with tax exempt state and local bond checks averaging over $2,500 per week (that's over $130,000 per year tax free). They avoided paying federal and state taxes on over $5 billion, which must be made up by the rest of us. The SF Green Party calls on the public to join us in working to phase out this regressive and unfair subsidy of the rich and their investment bankers (who take millions of dollars off the top when the bonds are issued). There are a few cases in which Greens have supported bond measures. In general, we are willing to support bonds that are issued to in order to build urgently needed, publicly-owned infrastructure, such as a public hospital or high speed rail. We generally oppose bonds that fund ongoing maintenance projects; these should be paid for using City revenues (which should be increased by raising taxes on the wealthy).